Across Des Moines, Christians such as myself are gathering in churches, awaiting the coming of a child with song and prayer. Yet, there is also a deafening silence enveloping the institutions where my fellow white Christians gather. While we celebrate the birth of a child, we all too often ignore the death of Black children, like Tamir Rice and Aiyana Jones, killed by police. Fellow white Christians: when was the last time race was discussed in your church? Has your pastor ever spoken the name of Tamir Rice or Aiyana Jones, of Eric Garner, of Deshawnda Sanchez? 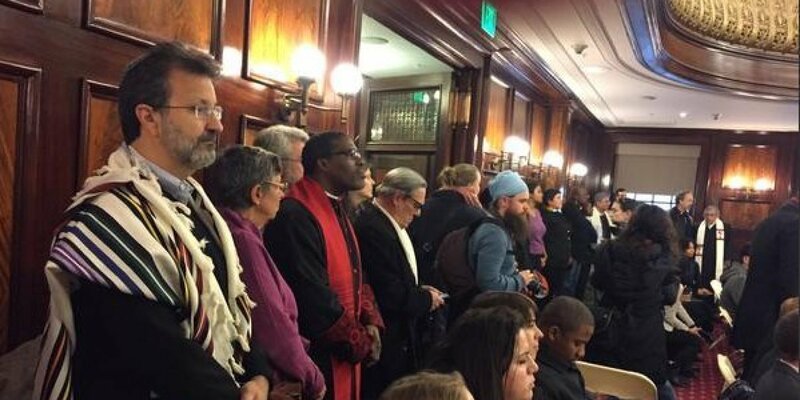 Do our church leaders speak publicly against racial disparities in Iowa’s justice system, called “the worst in the nation” by the ACLU? Do we uphold a narrative of a white Savior or the more truthful narrative that Rev. Serene Jones recently called “the story of a black body being killed by the most powerful nation in the world”? White Christians must do racial justice work now. We must centralize the voices of Black and Womanist theologians like James Cone and M. Shawn Copeland. We must engage books like Jennifer Harvey’s “Dear White Christians” that call for racial reparations. We must work with and support racial justice groups like AMOS Iowa, the NYC Justice League, Hands Up United, Millenial Activists United and the Dream Defenders. We must take to the streets and attend rallies and marches to transform our racist criminal justice system. Until we affirm that Black lives matter, we are complicit in the sin of racist state-sanctioned violence. This entry was posted in News & Media, Uncategorized by John Noble. Bookmark the permalink.